TSC classifies risks based on the contents of the equipment and operating conditions, formulates the procedures of equipment safety management and plans a plant maintenance and service system based on critical levels. Detailed inspections are planned for dangerous equipment to ensure safe operation of the equipment. During the use of dangerous equipment, automatic inspections, key inspections, operating inspections shall be carried out according to laws. In addition, regular inspections shall be carried out by labor inspection agencies within the statutory period. For hazardous gas and chemical supply systems, toxic gas monitoring systems, process exhaust gas treatment systems, there are regular inspections and maintenance procedures in place. In the area of equipment, safety management methods are proposed in response to the safety needs of people, incidents, places and objects and they are controlled by standard operating procedures. To deal with the transformation of the business and the retirement, resignation and turnover of personnel, the Industrial Safety and Environmental Protection would carry out the investigation of training needs of the general staff. TSC has developed the annual training program to ensure the industrial safety of the laborers based on the "Occupational Safety and Health Education and Training Rules". Besides, to increase the knowledge and management ability of the persons in charge of workplaces in occupational safety and health, letters are sent to the persons in charge who have not yet received the training to require them to participate in the “Occupational Safety and Health Training” they need. Before the newly employed or transferred personnel commence their work, each unit is must provide training to them based on the nature of their business and work requirements and keep records of the training for review. In 2017, a total of 10 sessions of occupational safety and health-related education and training were conducted and 421 people were trained. In order to reach the goal of zero disaster through education and training to deepen the employees’ safety awareness in the workplace, we have worked on the organization of training for “foreseeable risk training for zero disaster” and “traffic safety propaganda campaign”, leading our employees to master hazard identification before the work to take early measures and prevent any possible occupational accidents. 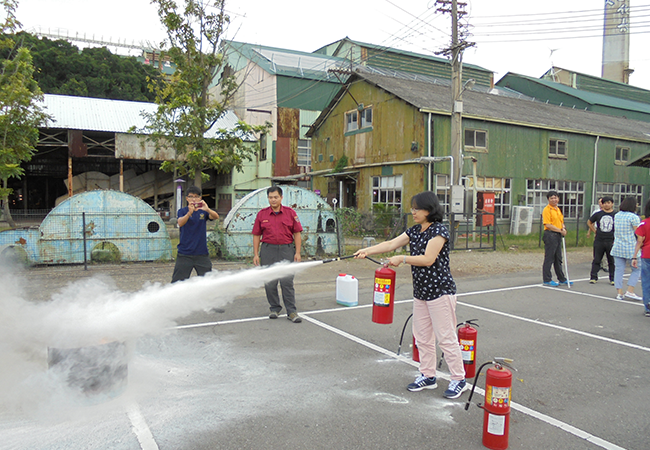 In 2017, 18 units continued to organize training for “foreseeable risk training for zero disaster” with 1,786 participants, and the performance was included into the annual assessment to encourage all units to implement the training. To promote employee awareness of industrial safety and environmental protection, prevent incidents of occupational hazards and pollution, promote employee safety and health, protect the environment and show good will, the “Industrial Safety and Environmental Protection Month” event is introduced in November 2017 to promote content in environmental protection, mainly including green embellishment for the area, disaster prevention, earthquake and safety as well as environmental protection education. We also carry out safety training, promote various advocacy activities, implement contractors’ occupational safety management and audit, implement the 5s activity in the factory area, implement occupational safety audit and inspection, disaster prevention and rescue and various emergency response drills, implement the management of the licenses of dangerous machinery and equipment and its operators, carry out the industrial waste reduction, recycling of waste and waste sorting.